Sorry everyone but I couldn’t able to update daily these days, as because I am a student of class 12 and also the student at Arena Animation for Graphic and Web Designing and got exams and project works, so I don’t get time to update these days and also won’t be able to regular for more 2-3 weeks, again sorry for that. 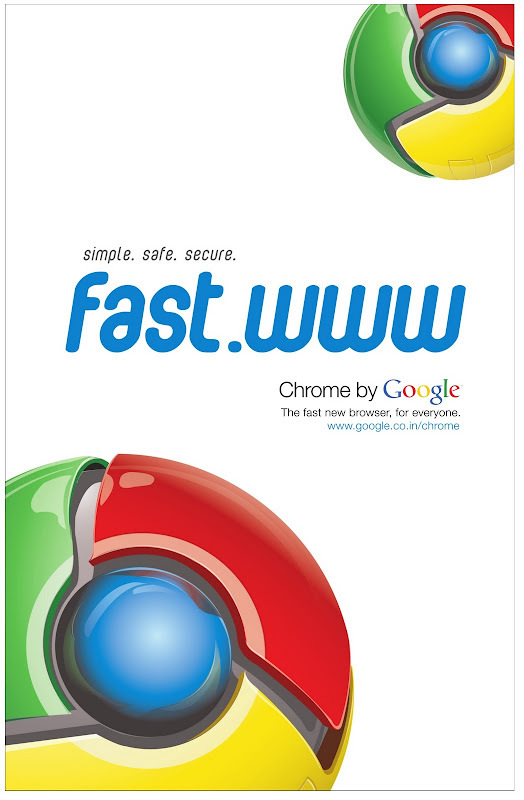 Anyways today Google have tried something new in Indian press advertising industry by doing a full page advertisement of a Web Browser (Google Chrome browser). In most of the daily read English newspapers, in case the ad didn’t came in your newspaper then here is a look of it. I have a Q is that to whom Google targeting by advertising it on Wednesday not on weekends. Hi! Everyone, hope you all are fine and not got bugged by Twitter.com. There is a bug roaming in twitter website that will auto-update your Twitter timeline (status) with some links with onmouseover bug. This spreads like infection, if any of your following will get into this but and if you are also logged-in using twitter.com then this can affects your timeline also. If you want to use twitter then use it with any twitter clients. Update1: If any of you don’t have any other twitter clients than you can do is just go to mobile.twitter.com and sign in their, then delete those bugs. Do this fast so that others don’t get effected due to you. And for safe side change your password also. Update2: Twitter have identified and are patching a XSS attack, please message @safety if you have info regarding such an exploit. In this post I will tell you about a new innovative ad in a printed newspaper. 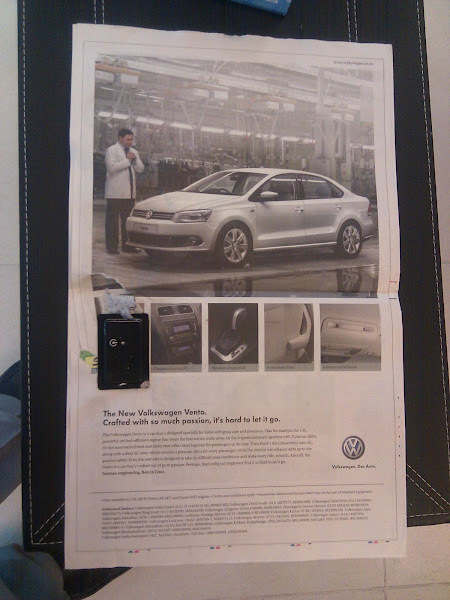 This morning (21st Sept 2010) the readers of Times of India (TOI) newspaper where got an innovative ad by Volkswagen in the last page of paper. The ad looks like a regular full page ad, as people turned to the last page of newspaper the ad start taking by itself. This ad goes on playing with endless loop till you close the paper. 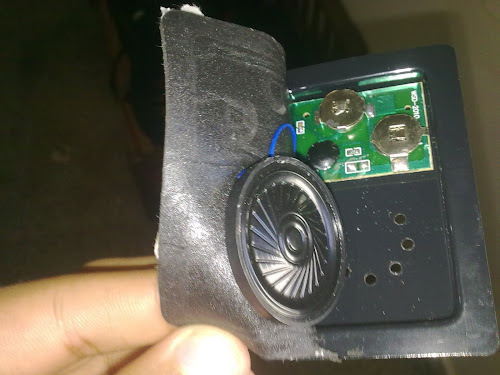 Every paper caring a small thin speaker (see in the below image). According to livemint this ad cost `7crore. If you like this Vodafone BlackBerry ad and want to join their official club on Facebook then Click here or want to get there as your CallerTure or Ringtone Click here. In this post I will tell you about New Twitter. 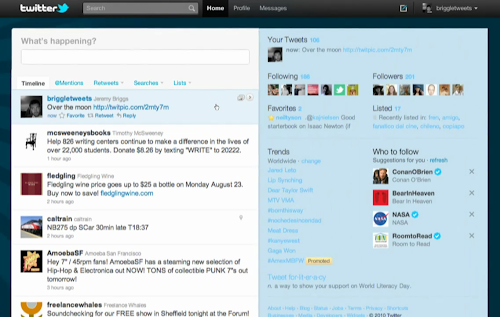 Today Twitter announced their new layout and features in twitter .com, which is going to be a good challenge for all the Twitter Desktop Apps. In new Twitter 1st of all you will notice two wide panels and a navigation (nav) bar on top. Left panel is for Timeline and the right panel is for the other details, you will also see the right panel size is become twice as before, so that you can get more details. If you click on a tweet, it will appear on the right panel with extra details like: how many people who have retweeted it and if that tweet contains any video or image link it will get embedded below, for that Twitter have partnered with 16 companies like YouTube, Flickr, USTREAM, TwitPic and so on. Now you have a shortcut button to tweet in right side of nav bar and @Mentions, Retweets, Searches and List option gone at the top in Timeline panel. As before if you visit any profile’s or your own Followers and Following list you huge to see their last tweet but now you will see their bio written below. Now if you click on geotag it will open within the same page. Not as before it will open a new Google Maps window. 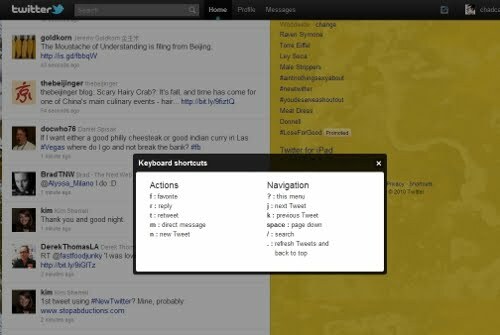 Twitter Settings options is as before it was, no changes in that. Note: New Twitter is not rollout for everyone it is still in testing, they are rolling it slowly to everyone. And if you are using New Twitter or after reading this let us know what you think about it.